Chocolate Gooey Butter Cookies! Your favorite ooey gooey butter cookies made with chocolate! Food blogging is so weird. There are so many things that go into running a food blog; so many pieces of advice that get thrown around here and there. One of the pieces of advice I received last week was to celebrate Christmas in July and make Christmas cookies for my blog right now. I immediately thought it was so silly and I wrote it off. But then, Christmas cookies won’t leave my head. Especially these Christmas Lights Cookies! And since it’s about to be the season where it’s too hot to turn the oven on, I decided to have a few cookie baking sessions before the summer heat arrived. You don’t mind, right? It’s been a delicious few days! So many chocolate chips (many of which fell on the floor, which my dogs ate and SURVIVED!). There were also so many chewy cookies, and so much love to share. While I am fearlessly dedicated to mini desserts that I don’t have to share, I enjoy making 1 dozen cookies, eating 1 (ok, fine–TWO), and then passing off the rest to friends and coworkers. If you made my regular gooey butter cake cookies, this is the chocolate version. 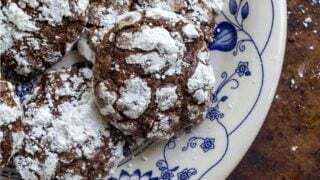 Chocolate gooey butter cookies are great served on the same plate as the regular ooey gooey butter cookies. I can just see a pretty plate of Christmas cookies with plain gooey butter cookies on one side and this chocolate version on the other side. My friend Spencer makes a beet and lemon gooey butter cookie version from this recipe, and they are so pretty, too! 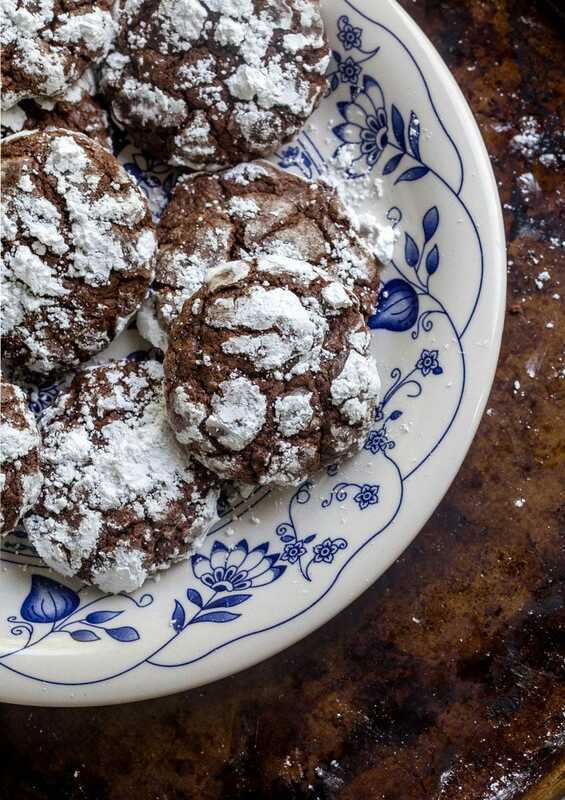 If you over-bake these cookies, they end up just tasting like soft chocolate crinkle cookies. It’s not bad, but you really want that gooey center. So, stick to the baking time, trust yourself, and you’ll have chocolate GOOEY butter cookies. Oh oh, and if I’ve learned anything from my other gooey butter cookie recipe, it’s that I need to reiterate how important chill time is (for the cookies, not for you and me…). Try try try to chill them for 1 hour at least before baking. And then, when you’re scooping, be quick so your hands don’t warm the dough too much. Chilling the dough overnight is always an option, too! Ok, the rest is up to you! Best of luck! Don’t miss the how-to video for this recipe at the top of the post if you’re using a mobile, or in the sidebar if you’re viewing this page on Desktop! A small batch of gooey butter cake cookies with chocolate! Next, add the whole egg, and egg yolk. Beat until combined. In a separate small bowl, whisk together the flour, cocoa powder, baking powder, and salt. Add this to the cream cheese mixture in three increments, beating in between each addition. Chill the dough in the fridge for at least 1 hour. This is not optional. Like, at all. I think I’m going to make these, the regular ones, and the beet ones, then stack them together. A gooey butter sandwich. Oh gosh! I love gooey butter cake, and have made gooey butter BARS, but I’ve never thought about gooey butter COOKIES. They sound (and look) so amazing! Totally agree. I’m going to ask my mom to make these for me. Just kidding! I’m a grown man. That sounds ridiculous. I make cookies….all the time lol. So I fully support this July cookie idea! Esp. these amazingly delicious look choc gooey butter cake cookies—2 amazing desserts in 1! These look so good to my 40-week-prengant-eyes!! Ahhhh!! I think I have to make them. I like that they only make one dozen so I can’t go too crazy. And if I have to wait an hour for them to chill I guess that’s a time for me to do the dishes and nest for baby. Win-win!! It’s always the perfect time for cookies. My family would definitely love a batch of these. These look so delish!! I’m just whipping up a batch for my stepkids–batter is in the fridge. :) FYI, I noticed that there is no vanilla measurement in the recipe (I guesstimated for mine). Can’t wait to pop these in the oven and dig in!! How much vanilla?!? Step 3 calls for it to be added but it’s not included in the list! Hi Brigid! I’m so sorry! They don’t actually use vanilla. I think what happened is that I pasted in the direction from my regular gooey butter cookies (https://www.dessertfortwo.com/gooey-butter-cake-cookies/), and those have vanilla. These do not because the chocolate is enough. I hope your cookies turned out okay! Did you use unsweetened cocoa or is Dutch processed cocoa ok? Normal unsweetened cocoa powder, sorry! I haven’t tested the recipe with Dutch processed cocoa. YES!!! I want a gooey centered cookie. These look phenomenal! What a great recipe! These look so delicious! These cookies are just beautiful and sound delicious! These look amazing, my daughter makes something similar and they are always gone SO fast! Can’t wait to give her your recipe! Your photography is sooooo good! Love this recipe! I just made this. Mine look different though. They’re smooth and round (kind of like chocolate ‘nilla wafers), and there’s no sign of the powdered sugar I used. Any idea why? Still delicious and great for using up the last bit of cream cheese. Oh no, Jodi! I’m sorry! Did you measure the granulated sugar correctly? An excess of sugar in these cookies is what makes them spread and crack. Other than that, I’m wondering if your oven is okay? And did you make the cookies the same size as me? Did you get >12 cookies? Oh, and I roll my cookies in A LOT of powdered sugar. I have little piles on the baking sheet when I transfer them because it’s so much.